Neural Trader is an artificial neural network framework which was specially designed for financial applications. Intended for use by software developers, it is an Artificial Neural Network (ANN) which simulates basic parts of the brain. To train a neural network, you must have a data set containing sample data (inputs), which correspond to the results (targets). For example, you may either use technical indicators, or you may use the price of various stocks, gold, oil, or currencies, or even fundamental data as inputs into a neural network. The target value may be future price, market direction, or volatility, for example. The data used for training is usually obtained using historical data in which the outcomes are known. This is called the in-sample training set. 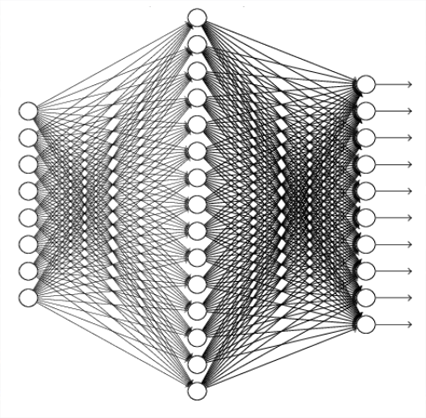 Once the training and machine learning process is complete, the neural network will be able to predict answers when new inputs are processed. Neural Trader helps developers build powerful A.I. (also known as cognitive computing) trading applications using a variety of programming languages, such as C++ and C#. Neural Trader features fast online training, multiple inputs/outputs, unlimited hidden nodes and network growth, simulated annealing, state saving and loading, principle component analysis, and much more. The programming library is dependency-free and provides an unparalleled level of computational intelligence to developers, making it suitable for a number of financial applications.